Genuinely sad news today coming out of Hollywood. Legendary television actor John Forsythe has died; he was 92. Reports are stating he passed after a year-long battle with cancer. I can’t even say what John Forsythe is most known for – there’s just so much to choose from! He was Charlie – rather, Charlie’s voice – on the Charlie’s Angels TV show; he also served as Charlie for both of the Charlie Angels movies. 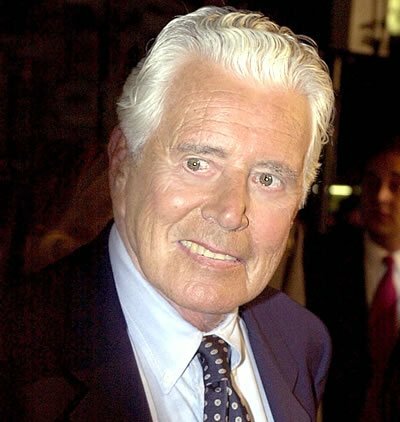 John Forsythe played Blake Carrington on Aaron Spelling’s over-the-top television show Dynasty*. In the Christmas classic (it’s a classic to me, anyway) Scrooged with Bill Murray, Forsythe played Murray’s dead boss. next post: Jesse James Is A “Broken Man” – BooF*ckingHoo Cheater! 50 queries in 1.453 seconds.